Kit Kittredge drew a deep breath as she paused outside the big brick building that housed Cincinnati's newspaper. Maybe today my dream of becoming a reporter will begin coming true! she thought. Thus begins Kathleen's Agatha Award-nominated Kit mystery book, which is also her fourth American Girl story, and ninth published book. Written for readers age 9 and up, it is one of the author's most popular. 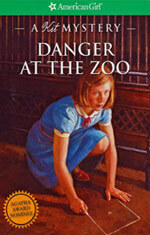 Kit Kittredge is back, in a mystery that takes place at the Cincinnati Zoo! Kit lands a summer job writing a children's column for her local newspaper and looks for story ideas at the Cincinnati Zoo where her friend Stirling works as a guide and her old friend Will, the hobo, has a job cleaning cages. As Kit noses around, she stumbles into some strange activities in the monkey house. Meanwhile, Kit begins to notice small things missing at home too. It's not long before Will looks like the logical suspect in both places. Can Kit clear her friend--and get a good story in the bargain? Fireworks fly as Kit's mystery is solved at the zoo's grand Fourth of July spectacular. This book includes a richly illustrated "Peak Into The Past" essay. Originally published as a 192-page story in softcover and hardcover, it is still available in multiple ebook formats. "Those who love 'American Girl' books will be clamoring for it." "With equal parts suspense and intrigue, Danger at the Zoo will hold middle grade readers' imaginations until its swift and satisfying conclusion." NOTE: You can buy 'as new' softcover and hardcover copies of Danger At The Zoo—while supplies last—directly from me, signed and personalized as desired. Request a quote by clicking HERE. Researching a novel can be hard work. 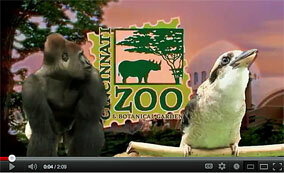 For this one, I had to spend a day visiting the Cincinnatti Zoo! Don’t you feel sorry for me? …No, I didn’t think so. I chose to write a mystery that was partly set at a zoo because I love animals. This is one of my bestselling books—so far, anyway—so I think lots of readers must love animals too! This story is about more than fun times. It’s about loyalty, and trust, and friendship. It’s about a girl smart and brave enough to look for answers in times of trouble. Enjoy! Much of Danger In The Zoo takes place at the Cincinnati Zoo. Key scenes in the book are set in what in 1934 was called the Monkey House. It still survives and can be visited. This video tells about the building's history and renovation. PLAY. 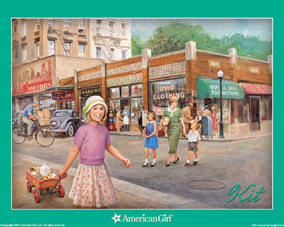 To see a bigger copy of this illustration showing Kit Kittredge running an errand in her hometown of Cincinnati, Ohio, in 1934, click on the image below.